Today’s workforce is learning in new ways, and it’s deeply impacting the way Learning and Development professionals need to approach training. Not only do we need to design effective traditional learning programs, but we also need to provide structure to the informal learning taking place on a daily basis in our organizations. Recently, Sarah Danzl, Director of Enterprise Marketing and Communications at Degreed, provided a timely recommendation for managing this changing landscape. In her expert opinion, when done correctly, content curation can create this much-needed support to informal learning opportunities. During her informative BYTE session, Content Overload 101: Making Curation Easy, Sarah defined curation as it relates to training, explained its importance to both organizations and individual learners, and provided a framework for getting started with this new approach. This post will share that definition of curation, as well as how it can help both business and individual learners. To review Sarah’s full presentation, click here. 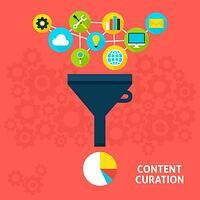 What Is Curation? Why Do We Need It? Sarah defined content curation as, “sorting through the vast amount of content on the web and presenting it in a meaningful and organized way around a specific theme.” This process involves sifting, sorting, arranging, and publishing this information. The goal is to simplify the experience of informal online learning and ultimately, to empower your learners. Today, the employees we’re teaching in our organizations are looking beyond our traditional training catalogs to build their skills. Degreed’s recent study showed that, on average, 70% of employees take live, virtual, or eLearning courses from their employers at least once a year. It’s standard for them to participate in a planned, structured event about once every three months. What’s really important to realize though, is that our learners are "connecting the dots" on their own between the training programs we provide them. They’re online Googling, social networking, and YouTubing the answers they need when they encounter on-the-job questions. Sarah pointed out that this is where our focus needs to shift: from the traditional programs we’ve created, to more informal performance support. Curation, as she defined it, is an opportunity for us to make this change. The power of curation is that it overcomes the content technology overload learners experience on a daily basis. Every minute there are 4 million inquiries on Google and 2.5 million posts on Facebook – how do our learners know what information is valid and relevant? As learning professionals, if we provide on-demand curated content, we are sorting through the noise to provide the information that best addresses their questions and concerns. Curation benefits two groups: individual learners, and the organization. Individual learners, Sarah pointed out, “want access to the right information at the right moment of need.” Curation allows learners to empower themselves. They can continue to reach out for information when they need it, and they can reach out to us for those resources. No longer will our learners have to wait for our specific training offerings to get their needs met. That’s hugely powerful. Review all of Sarah’s advice and her insight into using curation to support modern learners, review her full BYTE session recording by clicking here. You can follow Sarah on Twitter @sarahdanzl, and access Degreed’s Curation Pathway by clicking here.